The VMworld sessions have now been submitted and are awaiting the public vote on VMworld.com, following on from last years successful PowerCLI session there have been 12 PowerCLI focused sessions submitted this year, what's great is to see the different ways in which they are all using PowerCLI. Make sure you log into VMworld.com and cast your vote now ! This entry was posted in VMworld on May 10, 2011 by Alan Renouf. I submitted one as well, #1939, but it’s technically not PowerCLI. 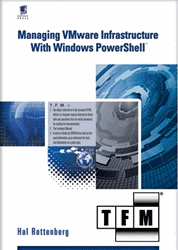 It’s about using PowerShell to manage vCloud Director. Good luck to all of the intrepid Powershell speakers! Thanks for the devotion! PowerCLI wouldn’t be what it is without such a strong community!